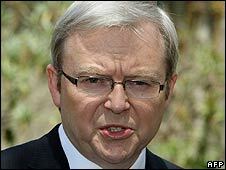 The Australian Prime Minister, Kevin Rudd, has said he will consider calls for a parliamentary inquiry into the Church of Scientology. But he said the evidence must be looked at carefully before proceeding. Senator Nick Xenophon launched a scathing attack on Scientology, citing letters from former followers alleging extensive criminal activity. Scientology spokesman Cyrus Brooks said the senator's attack had been an abuse of parliamentary proceedings. Senator Xenophon tabled seven letters from former Scientologists who he said were willing to co-operate with New South Wales and Australian federal police. "The letters received by me which were written by former followers in Australia, contain extensive allegations of crimes and abuses which are truly shocking," he said, citing other letters from people who prefer to stay anonymous. Senator Xenophon said their correspondence implicated the organisation in a range of crimes, including forced imprisonment, coerced abortions, physical violence and blackmail. "In my view, this is a two-faced organisation," he told the Senate. "There is the public face of an organisation... that claims to offer guidance and support to its followers and there is the private face of an organisation that abuses its followers and viciously targets its critics, and seems largely driven by paranoia. "These victims of Scientology claim it is an abusive, manipulative, violent and criminal organisation," said Senator Xenophon. "Scientology is not a religious organisation, it's a criminal organisation that hides behind its so-called religious beliefs," he said. A Scientology statement said the allegations were "about as reliable as former spouses are when talking about their ex-partner". It described the former members' statements as constituting a "propaganda campaign that would suit a totalitarian regime, not Australia, a country that recognises freedom of religion". Mr Rudd said he would consider Senator Xenophon's call for a parliamentary inquiry, noting he had made "grave allegations". 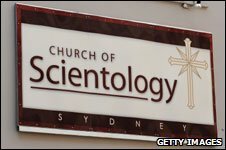 "Many people in Australia have real concerns about Scientology," he told reporters. "I share some of those concerns. Let us proceed carefully and look carefully at the material he has provided before we make a decision on further parliamentary action." "I don't want to rush into any judgement on this," the prime minister added. The Church of Scientology has provoked controversy since it was founded by science fiction author L Ron Hubbard in 1953. Given religion status in many countries, it enjoys tax-free privileges - but revelations from former followers have sparked huge legal battles in Europe where in several countries it is deemed a sect, not a religion. Last month, a French court convicted the Church of Scientology of fraud.